Jordan found me through photos of my 1987 Toyota Van. She and her boyfriend Devon own a 1988 Toyota Van Wagon and are part of a 1984-89 Toyota Van Facebook group where users share tips, tricks and photos of their beloved vehicles. 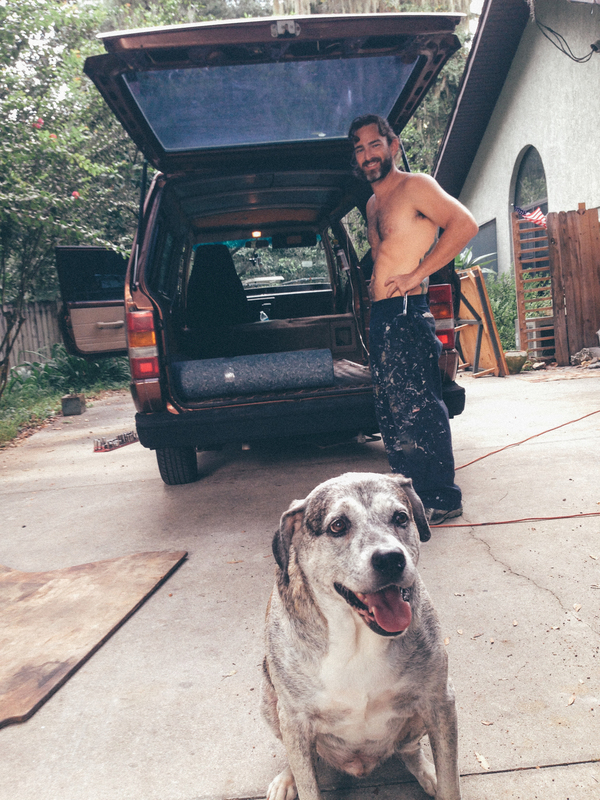 For those of you looking to convert your van into a tiny house or who need some tips to organize your small space, Jordan gives us an insider look at van life. Remember the "Saturday Night Live" skit where Chris Farley portrayed living in a van down by the river as the epitome of failure? Although that skit is hilarious, we would have to respectfully disagree. Buying a van to live on the road is a way to experience freedom and happiness. We equate feeling truly free and happy to being very successful. So we bought a van, converted it into a camper, told our friends and family about our trip and set out to redefine society's idea of success. After months of researching vehicles and going back and forth between the idea of a newer van or older van, we chose a 1988 Toyota Van Wagon. We liked the unique character of this van, its reputation for reliably and the great gas mileage. We bought our van in Tampa, Florida, from an older hippie guy, and once we got it home we realized we had a lot of work to do. In fact, it was an overwhelming amount of work to do. Love of traveling: The two of us have done our fair share of traveling in the past and weekend getaways were never enough. Escaping routines: Another reason we wanted to try out van life was to get out of the habit of waking up, working, eating, sleeping and doing it over with only a little playtime. We wanted to try a lifestyle that would bring a new day each day instead and the same ol’ day over and over again. We needed to try doing something we love first before taking on a lifestyle that was just safe. The fear of becoming an older person with regrets of never trying probably scared us the most into trying out van life. When we would tell people what we were about to embark on, we heard the same responses over and over again: “Man if I could do that I would!” “That’s sounds amazing! I wish I would have done that before having children or started a career.” and etc. For the most part, the people who said this to us were people who could make the change too. We think we’re just crazy enough to actually do it. Our family and friends might have poked fun at us while they could, but for the most part they were extremely supportive of our decision. We feel very fortunate to have the love and support from the people we care about. The first thing we did was give our van a much needed tune-up. We put in new fluids, filters, belts, alternator, battery, etc. After that, we spent several weeks junkyard hunting to find new parts. The first thing we fixed were the windows, as the previous owner put in home louver-style windows to keep it cool in the hot Florida summers. While it looked cool, the windows actually leaked when it rained and seeped in air when it was cold outside. They had to go. We replaced them with windows from a Chevy Mark III and installed a roof rack we found on a GMC Jimmy (Chevy Blazer). We were also lucky enough to find a hitch from a Dodge Neon. With the help from our welder friend, it fit on the front of our van perfectly. Now the fun part: building out the interior. 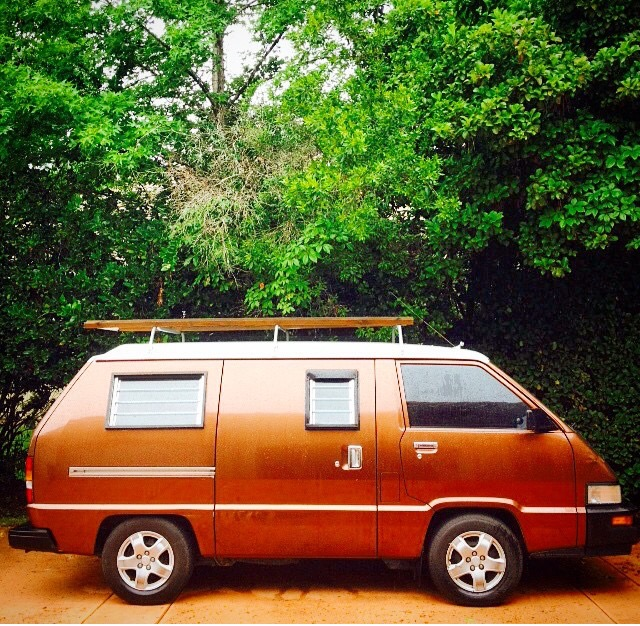 When we bought our van, it was completely bare metal on the inside, so we had a clean slate to work with. We insulated the floor, added hardwood floors that we bought used off Craigslist, insulated the walls and ceiling and built wall panels out of plywood. We covered the wall panels with indoor and outdoor carpet from Home Depot and added some striped fabric to the ceiling. Above the driver and passenger seats, we added corkboard so we could stick pictures of family and friends and memorabilia that we found on the road. We hooked up our 100-watt solar panel that we purchased off of Amazon. The solar panel charges our two inline six-volt leisure batteries, which runs our 2000-watt inverter, USB ports and cigarette lighters. Then it was time to build our bed and add extra storage. Since the inside of our van is pretty small, we had to get creative. We wanted as much of a full-size bed as possible but didn’t want it to take up the entire van. We found a design online that consisted of a two-part bed, and from the original design, we modified it to fit ours. It is an L-shaped bed design that can be a couch during the day and pull out into a bed at night. We bought a king-sized three-inch memory foam mattress from Craigslist and cut it to fit our design. Under both sections of the L-shaped design is storage for our clothes, cooking equipment and food. For extra storage, we bought a rooftop cargo carrier that we call "the adventure pack" because it holds our two folding bikes, inflatable kayak and overnight hiking packs that have all of our camping gear. We just needed to add the final touches. We purchased a hitch rack and filled up a storage box we had at home with our winter clothes and Devon’s work equipment. On the inside of the van, we built a small fold-down table behind the driver seat, attached our fishing pole to the ceiling and went shopping at Ikea for more storage ideas. We were able to find small shelves to hold our spices, a towel rack that we use to hang small buckets and storage pockets that have Velcro on the back that stick to our carpet walls perfectly. We have S hooks that hold our pots and pans, a paper towel holder made from wire and bungie cords attached to the ceiling that hold our towels yoga mats and window screens. So far we are just a few weeks into our trip, and it has been a lot of driving. There are many things we want to work on for ourselves during this time. We’d like to break away from being a consumer and focus on discovering our passions and talents. We want to try several kinds of jobs to search for a career that we enjoy so we can say, “We do what we love and never work a day in our lives." We hope to travel to many places and find an area that we love. Essentially we are in search of doing what we love and in a place we want to do it. Whether its work or pleasure, we are hoping to expand our comfort zone. We want to spend more time in nature and enjoy the beauty and peace that it provides. Our plan is to travel, learn from people and places we visit and truly live a life worth living. All photos credit to Experience Bound.